Serving a God who can make the exchange. Through tears, the brand-new mother let her story spill out before a captive audience last week at our local pregnancy center’s fundraising dinner. Bravely exhibiting a rawness of emotion that’s often repressed by the more cowardly, the mother filled us in on the tough road she’s traveled. We learned that her unplanned pregnancy only added to the young mother’s health and emotional challenges -- the last straw maybe that would send everything crashing down in her life. But as most of us know, landing in the bottom of a pit can sometimes be just what we need to make us look up and seek help. And that’s just what this mother did. While she spoke, her baby’s hearty cry could be heard just a table over to the mother’s right. It was music to the ears of those in attendance who may have been thinking about the 55 million babies silenced by abortion since Roe vs. Wade. As the baby’s father cuddled her, the mother went on to explain how getting help from AAA Life Services was just what she needed to get her life back on track. There was a beauty in watching that young mother speak and hold her baby at that dinner. It was the ultimate picture of what happens when someone chooses to be made new by the gentle hand of God. After the woman spoke, I was amazed at how well I could relate to her struggles. Well, maybe most of us can. She’s not the only one who’s spent time at the bottom of that pit. Another young woman made her way to the podium after that and started her story out with a question, “Have you ever felt shame? Real, deep-down shame? Shame for the things you’ve done, where you’ve been and what’s been done to you? I was amazed at this woman’s candidness and the freedom with which she shared about her own destructive behavior. “I was doing my best to outrun God’s love for me, “ she said. And went on to explain how her hurt damaged her relationship with God. She too, ended up at AAA Life Services where she received love and peer counseling and was awakened to the redemptive power of God. Concluding her testimony, the young women let us know that in the end she turned to God. And joyfully she informed us that she and her new husband had their first child on the way. God brought beauty from ashes yet again. Joyce Meyer was a victim of mental, physical, emotional and sexual abuse as a child. Easily, she could have walked the road of the victim. She deserved to right? I mean, just look at her past. Meyer’s life epitomizes what God can do through a person who is yielded to him. In her book “Beauty for Ashes,” Meyer’s reaches out to victims of abuse who are, just like she was, trapped in a life of shame, fear and unforgiveness. So what do you think? 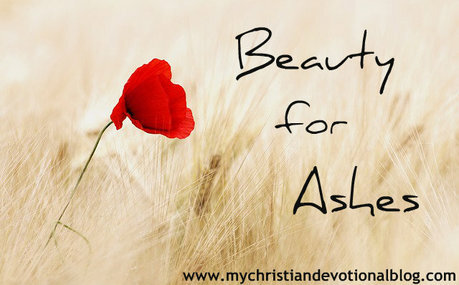 Have you been burnt and got some “ashes” you’re dealing with? Handing them over to God can be a beautiful thing.